This recipe came to me due to a lack of fruit and a lack of patience. My initial plan was to purchase small pears, such as forelle. Sadly none of my local grocery stores had any in stock. Instead I purchased bosc pears and figured I’d just make a bigger version of the initial plan. So, I cut the pears in half and removed their stems and cores. I set them in a pot with wine and let the simmering begin. I checked at 10 minutes, 15 minutes. They still weren’t tender. Granted, I started with underripe pears, but I didn’t want them to turn to mush. I began to fear that the outer portion of the pear halves would be become soggy while the centers stayed too firm. Thus, like any other sort of testing, it was time to try a new version that tweaked an ingredient. 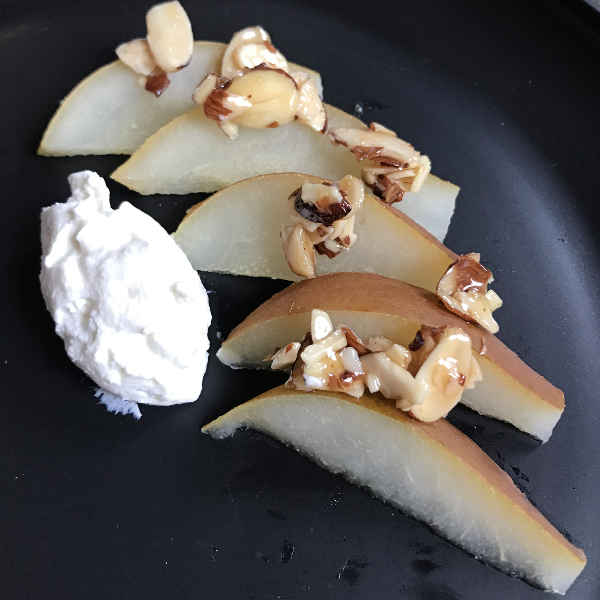 My tweak was poaching sliced pears. Although it wasn’t my initial plan, I’m glad I ended up there. It also allowed for impatient me to be done with poaching sooner. To continue with the easier to eat theme, this makes them a possible cocktail party snack, as they can be eaten while standing and holding a plate. Being deconstructed the goat cheese is placed on the side. No more cheese melting and dripping all over! What didn’t change in my recipe was the combination of ingredients. 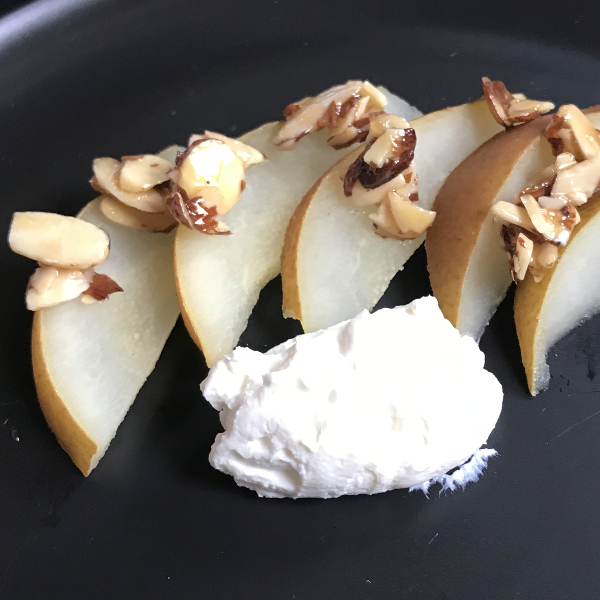 You have the pears infused with wine for a sweet, yet hint of dry, flavor. Then there’s the addition of goat cheese, which is nice and tart. Finally, it’s finished with maple-coated, sliced almonds, which round it out with sweetness. They truly could start or end your meal. Get ready for sweet, salty, tender, and crunchy, all in one dish! And without hours worth of effort. Truly a dish to please cook and diner. Combine almonds and maple syrup in microwave-safe bowl. Microwave on high in 30 second increments, stirring after each. When syrup clings to almonds and no liquid rests in bottom of bowl, remove from microwave. Transfer almonds to a cutting board or piece of waxed paper. 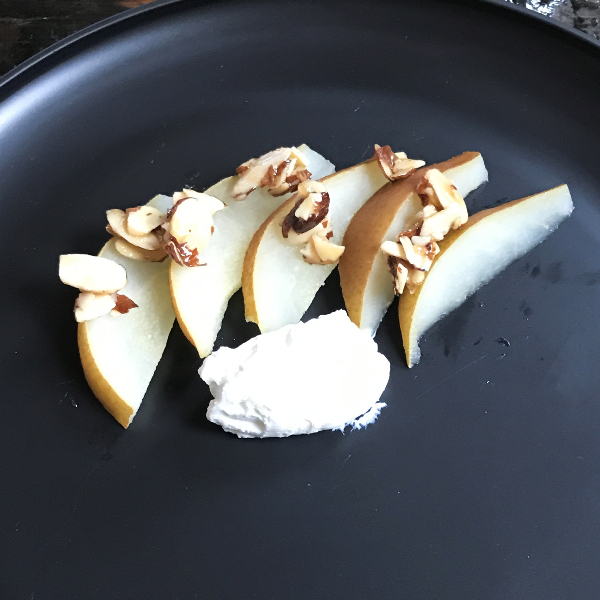 Spread out and cool.Cut pears in half, and carefully remove stems and cores. Cut each half into 10-12 thin slices. Pour wine into small saucepot, and place on high heat. When wine begins to boil, reduce to a simmer and add pear slices. Allow slices to simmer for 4-5 minutes or until just fork tender. While simmering combine goat cheese and milk in bowl of a stand mixer or regular bowl with hand mixer. To assemble: place 5-6 pear slices on plate. Form a quenelle of goat cheese, using two spoons.